12th Rabi-ul-awal marks the birth our beloved Prophet Hazrat Muhammad (Peace be upon him). Religious festivities are the part of Pakistani society; it promotes our religious and cultural values. For this purpose Eid-e- Miladun Nabi is celebrated with religious zeal and zest all over Pakistan. We celebrate Milad in order to send salutations (Esal-e-Swaab) to the Prophet [May Allah bless him and grant Him peace], give donations to the poor (Sadaqah Khairat) and remember wilaadah (Birth) and qualities of the Prophet [May Allah bless him and grant Him peace]. The Ahl as-Sunnah does not say that one must celebrate "Milad" only on 12 Rabee'-ul-Awwal, in fact it can be celebrated at anytime of the year. Every year Eid-e-Milad un Nabi is celebrated in schools and hospitals of HOPE to bring religious unity amongst the student and staff members of HOPE an educational NGO in Pakistan .These activities are carried out under the supervision of Dr. Mubina Agboatwalla, the child specialist in Karachi and Chairperson of HOPE. In these Milad gatherings, all the students and staff members of HOPE Zia Colony School and Hospital, HOPE Muzzafargarh School, HOPE Thatta School and Hospital and Informal HOPE Schools take an active part. Students and teachers prepare naats and remember the teaching of our beloved Prophet (Peace be upon him). Remembering the teaching of our holy Prophet gives a sense of forgiveness and satisfaction to the people who are working for the betterment of this society by extending a helping hand towards the poor. Dr. Mubina Agboatwalla, child specialist in Karachi hopes and prays that May Allah Ta'ala grant us the strength to partake in the mesmerized occasion of Jashne Eid-Miladun-Nabi (Sallallahu Alaihi Wasallam), so that we may show our contentment and gratitude to Almighty Allah and achieve forgiveness and Bounties of Allah Ta'ala which descend on this auspicious day. Mesmerizing snow capped mountains, fast flowing River Jhelum and Neelum, beautiful fruit trees and streams, all together make Kashmir a natural wonderland. But despite all this magnificence, the people of Kashmir are deprived of a lot of blessings of life. HOPE, an NGO in Pakistan has made an effort to provide educational facilities for the less privileged in this region and as also created employment opportunities for the underprivileged population. team around four hours from Muzaffarabad to reach these schools. The team had to walk for an hour and a half to get to these schools as there are no roads to accommodate a vehicle. On the 2nd day of the Kashmir visit, HOPE team visited three schools which had a total of 400 children belonging to impoverished families. The students dressed in uniforms presented tableaus and songs. 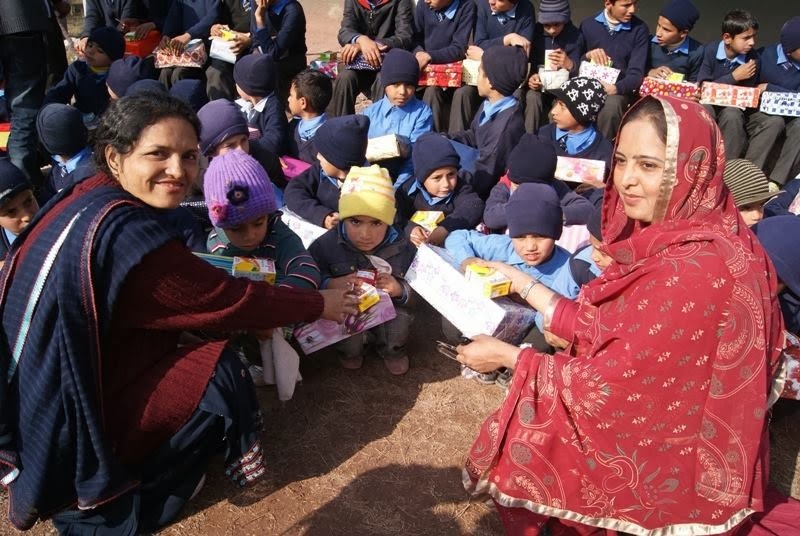 Gift hampers, given by the students of Jaffer Public School comprising stationary items, were distributed to the students of HOPE schools in Kashmir. In addition to that, one hundred school bags and food items were distributed to students located in Nagra, Garridupatta, Malsi, Dhanibaklan, and Hatyanbala. On the third day of their visit the team visited schools in Saryaan and Prahour, Hatiyanbala covering around 250 students mostly girls who get quality education in the remotest corners. Sweaters, socks, woolen caps, school bags and gifts were distributed and sumptuous lunch boxes were provided to the children. HOPE, an educational NGO in Pakistan is ecstatic to see its students in the mountainous regions of Kashmir studying despite the harsh weather conditions. Dr Mubina Agboatwalla child specialist in Karachi and a born philanthropist is of the view that providing basic necessities to the underprivileged class is obligatory for those who have the capacity to help.